In the current economic and political crisis, Aristotle’s Nicomachean Ethics is not likely to be one of the first places that Americans go looking for wisdom. It should be. Throughout the book readers find a wealth of knowledge and practical wisdom about what is necessary to live a happy life and what is necessary to promote the common good. What readers will not find is what is omnipresent in American culture, a blueprint for economic and political recovery. Aristotle is not concerned with public policy, today’s cultural obsession. One of the reasons why political philosophy tends not to be a reservoir of intellectual capital for contemporary politics is that it is among the most challenging types of reading. Deciphering the meaning of dense works of political theory takes time and patience. Another reason, however, is that many political theorists consider the spiritual condition of human beings to be a significant part of what determines their happiness and the degree to which justice is achieved in political and social affairs. The use of terms like “moral,” “spiritual,” “virtue,” or “soul,” can create uneasiness in those who prefer to conceive of politics only in secular and mundane ways. Unfortunately, the consequence is that the horizons of political thinking are narrowed; the full range of human experience is sacrificed in order to satisfy an ideological predisposition that amounts to an aversion or refusal to ask meaningful questions about the human condition. By contrast, Aristotle makes such questions the focus of his political theory. For example, in the Ethics, Aristotle distinguishes between pleasure and happiness. Pleasures are fleeting and insatiable. Some are consistent with the good life and others are destructive to it. Happiness requires that the former pleasures be sanctioned and the latter be prohibited. Refraining from alluring pleasures that breed discord and injustice requires the virtue of self-control aided by good habit. Without self-control, individuals become self-indulgent and to varying degrees engage in ethical anarchy. They are a slave to their passions. They live by the passion of the moment and consider all passions equally valid. They fail to see the danger in continually pushing beyond limits that are designed to keep human behavior within the boundaries of civilized life. To the individual lacking self-control and moderation, such boundaries may be considered part of an antiquated bourgeois or Victorian way of life. Emancipation from the limits of tradition and custom is the way to happiness. To this way of thinking, human beings will behave in a civilized manner without performing the ethical work that Aristotle considered the very substance of civilized life. Scientific organization of political, social, and economic institutions infused with humanitarian sentiment substitutes for virtue. If Aristotelian philosophy does not directly address the public policy needs of the day, then why spend time reading the Ethics? This question, in one form or another, is often asked on college campuses as a way of undermining the liberal arts. Higher education, it is argued, should be subordinated to the practical and not anything higher. What, after all, does Aristotle have to do with things that really matter like the current economic and political crisis? This line of thinking is itself demonstrative of the problem of immediacy that Aristotle recognized undermines happiness and civilized life. He knew the tendency of human beings was to be short-sighted. Political theory aims to look beyond the immediate and ephemeral to the permanent and enduring. What endures is more instructive to the needs of the day than what, in the end, merely provides a temporary respite from the anxiety of momentary political life. In what way can Aristotle bring understanding to current political and economic affairs? To the extent that American consumers failed to refrain from indulging their passion to consume more than was consistent with their happiness, they lived outside the Aristotelian mean. Moderation is for Aristotle a virtue that helps to keep individuals from excess and self-indulgence, vices that result in misery. 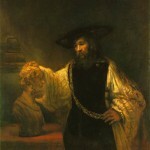 Individuals who act moderately Aristotle calls “magnificent” or “magnanimous.” Those who are incapable of acting in accordance with moderation Aristotle calls “vulgar.” If the existing ethos creates a cultural climate that is conducive to vulgarity, then individuals will be more apt to engage in pleasures that are destructive to happiness. The celebration of vulgarity in popular culture indicates that vulgar men and women are setting the tone rather than magnanimous men and women. In this way, economic and political problems are largely ones of conduct, practical wisdom, and leadership not intellect or public policy. Moreover, the burden to live a virtuous life is too great for individuals to bear on their own. The path to happiness requires friendship of a particular quality. Aristotle calls this “true friendship” and he distinguishes it from friendship based on mere utility or pleasure. True friends are essential in the quest for happiness because they act in a way that fosters virtue. Such friendships are uncommon and individuals are only capable of a small number of them. True friendship develops gradually over time; it requires a consistent regard for moral well being that does not sacrifice friendship for self-indulgence or convenience. True friends help one another live a moderate life. In the recent economic crisis, the greed that drove some individuals to engage in immoderate economic behavior is common in political and social life. What marks the character of a community, society, or nation is how it responds to such behavior. Justice requires that each be given what is deserved. Those who engaged in risky and irresponsible behavior ought to bear the bulk of the consequences for that behavior. This, however, has not been the general approach to the economic crisis. Banks and homeowners alike were bailed out by government spending that was repeatedly justified by appeals to the economy. In both instances the behavior of individuals in and out of government was immoderate and directed to immediate gratification rather than concern for happiness. Aristotle offers two important insights that are worth keeping in mind as the economic and political crisis is discussed. Moderation is a virtue and self-indulgence is a vice. Encouraging consumers and businesses to be more self-indulgent by feeding their habits of reckless spending and consumption is not wisdom or leadership but folly. In the early 1980s when conservatives were searching for their identity and purpose in American politics, George Will wrote a book that offered an Aristotelian thesis that was captured in its title, Statecraft as Soulcraft: What Government Does. Our current circumstances are in need of the reminder that politics and economics cannot function outside of the spiritual domain of human life and society. Plato and Aristotle made the point in the ancient world and it bears repeating. Public policy cannot take the place of virtue. This is not to say that all politics is virtue but that matters of the soul are an essential part of guiding political and economic life to justice and happiness. Dr. Michael P. Federici is Professor of Political Science at Mercyhurst College. He is in his twentieth year of college teaching. He received his Ph.D. in Politics from The Catholic University of American in Washington, D.C. (1990), his M.A. from CUA in 1985, and his B.S. in Economics from Elizabethtown College in 1983. Dr. Federici has published two books, The Challenge of Populism (1991) and Eric Voegelin: The Restoration of Order (2002) and several articles and book reviews. He has a forthcoming book, an edited volume of Orestes Brownson’s political writings (ISI Books), due out in 2010 and he is currently working on The Political Theory of Alexander Hamilton to be published by Johns Hopkins University Press. Dr. Federici’s teaching and research areas include American Government, Constitutional Law, Civil Liberties, Political Theory, and American Political Thought. Dr. Federici has taught American Government for the Junior Statesmen Foundation Summer School at Yale University and Georgetown University. He won the Joseph Friedl Award at Concord College that is given to the professor who “Exemplifies the true essence of the college professor” and he won the “Distinguished Teaching Award” at Mercyhurst College in 2004. Dr. Federici participated in a debate January 29, 2008 at Georgetown University sponsored by the Intercollegiate Studies Institute and the Tocqueville Forum on “America: Empire or Republic?” The debate is available on the web at: http://isi.org/lectures/lectures.aspx. He also gave a lecture at Notre Dame Law School in April 2008. He is currently president of the Mercyhurst College Faculty Senate and serves on the College’s Board of Trustees. He was recently appointed to the Editorial Board of the journal Humanitas and to the Board of Directors of The Academy of Philosophy and Letters. In August 2002, he was one of a select group of American scholars invited to deliver a paper during the Chinese Comparative Literature Association’s Conference in Nanjing, China. In 1993 Dr. Federici participated in a National Endowment for the Humanities Institute on Thomas Jefferson that was held at The University of Virginia and The College of William and Mary. He was a Distinguished Speaker for the Pennsylvania Humanities Council. In 2004 he wrote a winning grant application to the U.S. Department of Education for a $984,920 three-year grant from the Teaching American History Program for the Corry Area School District. In 2005 he wrote another successful TAHG for the Erie City School District for $499,736. He served as the Project Director for both grants. Professor Federici has been interviewed for local and national media including WJET TV, WICU TV, WSEE TV, C-SPAN, WQLN Radio, WJET Radio, WNYC Radio, WBEN Radio (Buffalo), The Erie Times News, The Philadelphia Inquirer, and CQ Weekly. After wallowing around in the immediacentric debate surrounding categories of conservative and then stumbling into this elegant bit of clear and present wisdom is like switching from a mad kegger at a Grateful Dead Concert to sitting at a desert campfire, listening to Keith Jarrett’s Koln Concert by starlight and sipping a little Laphroaig, neat….but only one, maybe two, at most. Much of conservative talk about “values” fails to mention the very obvious Aristotelian insight that mores and “sins” have not been arbitrarily chosen, but those pleasures that we call sinful we do so not because they are pleasant, but because they are distinctly not pleasant in the long-term. Questioning those values in the name of liberation is, of course, ignoring the collective wisdom of tradition, which was not, necessarily, received from on high or chosen arbitrarily, but learned through gradual trial-and-error. Oddly enough, Gov. Sanford brought up this insight at his press conference when he talked about activities being branded as sinful to protect people from themselves. Nice post. Well articulated. In respect to Aristolian ethics, few have understood that they hinge on friendship.